If you were going on holiday or making a trip it would make good sense to choose a destination and plan the route in advance. You may even make a list of the various roads, landmarks and turnings along the way if it was an unfamiliar route. In your journey through life, if you want to be happy and fulfilled, it makes sense to do the same. Without goal setting and planning you are leaving your future to chance. Your path through life is by accident rather than design. Any efficient organisation will have a stated vision of what the organisation wants to achieve and a mission statement of the route to get there. You can apply the same principles in any area of your life. Where can you apply goal setting? 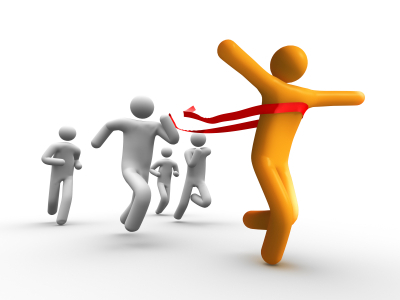 Many advocates of goal setting will advise you to set ‘attainable and realistic’ goals. The trouble with this approach is that it encourages you to under-estimate what you can achieve. If you study history’s high achievers you will find that they mostly set themselves massive and seemingly unrealistic goals. These were broken down into smaller sub-goals that could be achieved without losing sight of the grand vision. Thomas Edison did not set out to just develop an effective filament light bulb – his goal was to light the planet at night. In his lifetime he registered a record breaking 1093 patents achieving his big goal. Don’t limit yourself to easily achieved goals but make sure that you break big goals into smaller achievable ones with a plan and milestones along the way. Whilst it may not turn out exactly as you envisage, you can gain more clarity and insights into the likely progress. Another thing to bear in mind when visualising future success is to make the scene in your mind vivid and compelling, involving all the senses. After the initial goal setting it is important to keep focused and remind yourself regularly of your final target. You may have been told that if you repeat a positive phrase (an affirmation) to yourself enough it will come true. The inventor of Mind Mapping, Tony Buzan warns of the perils of badly framed affirmations. Let’s say you wanted to lose weight and give up eating chocolate as part of your health goal setting programme. You may think that saying each morning, “I will not eat chocolate” would be effective. However, the main focus of the sentence is exactly what you want to avoid. You will think more about eating chocolate, so you are doomed to failure from the outset. If instead you stood in front of the mirror saying, “I am slim and healthy” every day, it is a step in the right direction but, if the evidence from your eyes shows the opposite, you will once again fail. The brain naturally seeks out truth and will reject obviously false messages. Buzan describes a technique he calls meta-positive thinking. This puts the focus on the process of change and the desired outcome. So an effective affirmation could be, “I am becoming a healthy eater”. The focus is on the good new habit and it is true that you are on the road towards the goal. Personal development guru Anthony Robbins defines a goal as ‘a dream with a deadline’. It is important when goal setting to state the date by which time you want to achieve the goal. This gives the project urgency. It forces you to take action. If you don’t set a date but leave your goal as something you want at some woolly future time you can always put things off till tomorrow. Do you remember the British pop group Spice Girls bursting into the music charts in the 1990s with their song ‘Wannabe’? The key line in the lyrics is the phrase, “Tell me what you want, what you really, really want”. When goal setting make sure the goal is what you really, really want. There is no point putting a great deal of energy into something that you achieve only to find that it isn’t what you wanted. Imagine that I could wave a magic wand and give you your goal tomorrow. Would you be happy? Remember that goals can change over time. You can and should review your goals regularly and adjust them if appropriate. These are three cornerstones of Tony Buzan’s Mind Mapping that we mentioned earlier. Mind Mapping creates a graphical representation of your thoughts on a single page making use of images, colour and most importantly associations between ideas. Create a Mind Map and put it on your wall and you will be able to see all the elements of your goal at a glance and remember them. Mind Mapping takes time to master with pen and paper. Probably the biggest hurdle that most people find is that their artistic abilities do not match the pictures in their head. For goal setting you will be looking at the Mind Map repeatedly over time so need it to be pleasing to the eye. Luckily help is at hand. 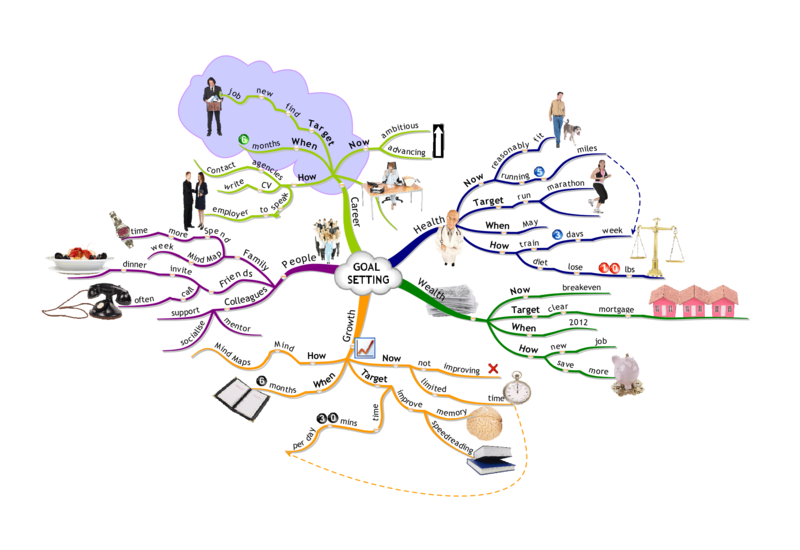 ThinkBuzan have developed a piece of software called iMindMap. This follows all Buzan’s principles very closely, making it intuitive to use.